If you’re a reader (like me) whose bookshelves are stacked heavy with poetry collections, then listen up: Monday, October 17 marks the 31st annual celebration of a holiday bound to get poetry lovers everywhere reading (even more than you already do): Black Poetry Day. Since 1985, October 17 has been recognized as Black Poetry Day, a celebration that is often associated with the birthday of Jupiter Hammon, a poet who was born into slavery in the United States circa 1711. While Hammon was never emancipated, he still became the first African American poet to be published in the United States, when his poem, An Evening Thought , was published in 1761. The unofficial holiday is marked by poetry readings and events that honor African American and Black heritage, Black authors of both past and present, and of course, the amazing poetry they write — so head over to your local library or your favorite indie bookstore today and see what they’ve got planned. And hey, as long as you’re there you might as well pick up a few poetry collections by Black poets, to celebrate Black Poetry Day. I’ve included some great recommendations for you below. Here are 13 Black poets to read, in honor of Black Poetry Day. Elizabeth Alexander is a poet, essayist, and playwright whose writing often focuses on politics, race, and gender. American Sublime is her fourth collection of poetry, and was one of three finalists for the 2006 Pulitzer Prize. Her poem Praise Song for the Day was written and delivered by Alexander at the 2009 inauguration of President Barack Obama. If that impressive resume wasn’t enough, she is also a founding member of Cave Canem, an organization dedicated to supporting the work of African American poets. In addition to being a mesmerizing poet and storyteller, Maya Angelou was also a fervent Civil Rights activist who worked for both Dr. Martin Luther King Jr. and Malcolm X during her lifetime. Her Pulitzer Prize-nominated poetry collection is Just Give Me a Cool Drink of Water 'Fore I Diiie, which blends personal memories of Angelou’s with ideas about how American racism manifests itself in our relationships. Another poet that blended activism with his writing was Amiri Baraka, a confrontational poet who used strong language and sharp imagery to jar his readers out of complacency and into their own space of activist passion. Baraka’s first published poetry collection was Preface to a Twenty Volume Suicide Note, which takes a look at American culture with humor, criticism, and wit. Gwendolyn Brooks’ poetry is best known for capturing a particular time and place in American culture: what life was like for an African American family living on the South Side of Chicago during the twentieth century. The Pulitzer Prize-winning poet tackles the racism, sexism, and economic inequality that she witnessed all around her, throughout her life, in her Selected Poems. 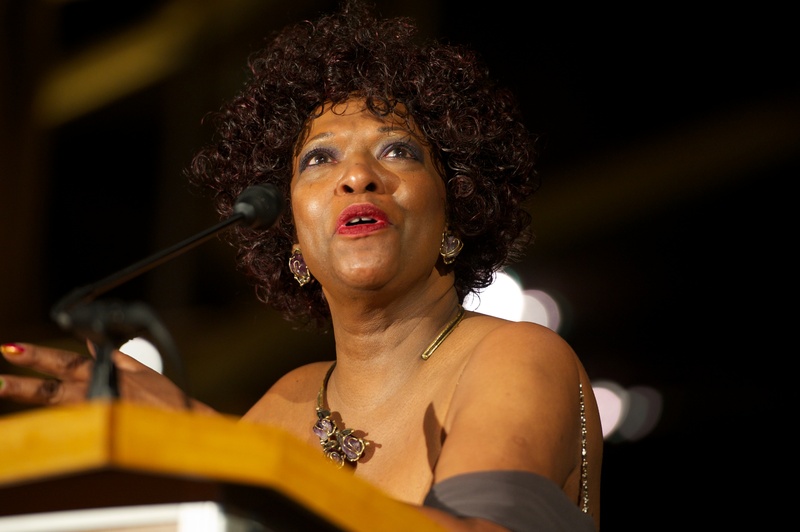 Currently nominated for a 2016 National Book Award for her Collected Poems 1974 – 2004, Rita Dove is known for writing expansive, wide-lensed poetry that is both beautiful and lyrical, and often honors other art forms as well. In addition to being nominated for this year’s NBA for Poetry, Dove is also a Pulitzer Prize and National Medal of Arts-winner and was the first African American to be appointed U.S. Poet Laureate. In addition to being first African American poet published in the United States, Jupiter Hammon was also the preacher for the slaves of the Henry Lloyd estate, where Hammon himself was born and enslaved his entire life. Considered a religious poet, "An Evening Thought" is the only poem formally published in his lifetime. An essential literary figure of the Harlem Renaissance, Langston Hughes wrote revealing and sometimes confessional poetry that told true stories about what life was like for everyday African Americans living in the United States during the 1920s. The Collected Poems of Langston Hughes is a must-read. During her lifetime June Jordan worked for human rights with as much commitment and passion as she worked on her poetry — and those twin commitments are reflected in her writing, which tackles issues of civil rights, women’s rights, bisexuality, and sexual liberation. Kissing God Goodbye: Poems 1991-1997 is a beautiful collection about the pain and beauty of personal, political, and cultural transformation. A total badass from the moment her writing career began with a poem published in Seventeen magazine when she was just a teenager herself, Audre Lorde used a lifetime of poetry to raise her voice against racism, sexism, and homophobia. In her collection The Black Unicorn Lorde is both exploring and celebrating each of her different, sometimes challenged identities: lesbian, black woman, mother, and feminist. Currently a professor of poetry at Yale University and recently awarded a MacArthur Fellowship (aka: “Genius Grant”) Claudia Rankine is best known by readers for her New York Times bestselling poetry, prose, and photography collection Citizen: An American Lyric — a multiple award-winning book that reveals and denounces the ways racism permeates American society, and will challenge many of the assumptions you might have about how racism exists in the world today. Tracy K. Smith’s first published collection of poetry, The Body's Question, won the Cave Canem prize for the best first book by an African-American poet in 2002. Since then she has gone on two write two other poetry collections, and one gorgeous memoir — all of which in different ways, tackle race, faith, art, humanity, womanhood, and a whole lot else. Published in 2013, Frank X. Walker’s poetry collection, Turn Me Loose: The Unghosting of Medgar Evers, explores the 1963 assassination of American civil rights activist Medgar Evers by segregationist Byron De La Beckwith. In the collection, Walker imagines the voices of those who were closest to Evers and his death — his widow, his brother, the man who killed him, and the wives of his murder as well. The collection is striking and emotional — and given the fact that it took over 30 years for De La Beckwith to be convicted, a timely collection as well. Writing shortly after Jupiter Hammon, Phillis Wheatley is considered to be the first published female African American poet — although her work, which wasn’t acquiring readership in the United States, was first published in Europe, and then in the United States. Born in Senegal, Africa and sold into slavery when she was only seven-years-old, Wheatley learned to read and write, and composed political poetry that has been credited with inspiring many of the poets writing during the Harlem Renaissance.